Trinity Western’s Josh Hardy scored in second half stoppage time to help the Spartans earn a 1-1 draw with MacEwan Saturday in Edmonton. 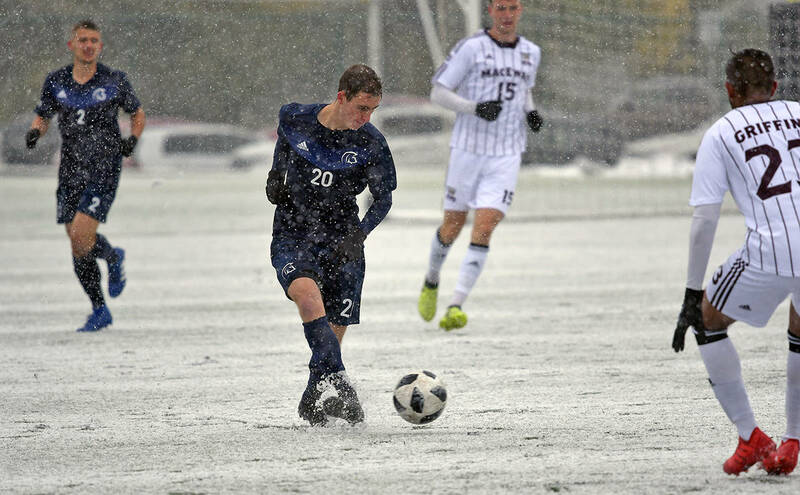 On a snowy afternoon, the Spartans (2-1-3) outshot the Griffins 32-8 and had a 17-6 advantage in shots on goal, but it took until late in stoppage time before Hardy finally broke through, beating MacEwan goalie Seth Johnstone with a shot from 12 yards out off a scrambled play in the box. MacEwan (3-2-1) opened the scoring in the 19th minute when Everett Orgnero beat TWU goalie Sebastian Colyn, who finished with five saves on the afternoon. The Spartans goal came after a flurry of TWU opportunities in the late stages, including an 84th-minute chance off the foot of Leighton Johnson that was stymied by a diving Johnstone. The Spartans pressed for the equalizer throughout the second half and had numerous opportunities, but it took until the late stages before Johnstone, who had a total of 16 saves, finally succumbed. TWU defender Bryce Prochnau started for the Spartans against his old team and in his hometown. Prochnau joined the Spartans this year after previously playing with the Griffins. “We played well,” said TWU Head Coach Mike Shearon. Saturday’s game was just the second time the two teams have played in the regular season. TWU beat the Griffins 4-2 in their only other meeting Sept. 17, 2016. This was the first time TWU has ever played against MacEwan in Edmonton. Hardy, who transferred to TWU before the start of the 2017 season, scored one goal in 13 games last year. The Spartans have scored a conference-high 14 goals this year. The Spartans continue their Alberta road trip Sunday when they play Lethbridge at 1:15 p.m. (PT). They return home for four consecutive games in Langley, before finishing the season with three out of four on the road.